If you have been charged with arrears, we advise you to personal go to the Revenue Protection Unit (RPU) in your region. The arrears bill must be paid at a SESCO Payment Counter. A copy of your arrears bill can be obtained at any SESCO Customer Service Counter for payment. If the wrong address has been registered on your tax invoice, you may send us a copy of the assessment bill via email/fax, or over a Customer Service Counter, for updating. No charges will be incurred for this service. If you would like your bill to be delivered to a different address, you may request for a change of postal address. There will be a charge of RM1.00 per account for every month that the bill is delivered to the postal address that is different to the bill address. Reason for adjusting the bill. You may submit these details either at a Customer Service Counter, via email to our Customer Care Centre, or via SEB Cares. 7 working days if a Meter Reader is required to confirm the meter reading on-site. If you have not received your bill, you may login to SEB Cares to view and/or print your latest bill. You can also obtain a copy of your bill at one of our Customer Service Counters, or call our Customer Care Centre to make an enquiry or report. A Late Payment Charge (LPC) of 1% will be imposed for every 30 days of non-payment from the invoice date. If the bill remains unpaid on the 90th day from the invoice date, a Late Payment Surcharge (LPS) of RM10 will be imposed. Below 0.85 and up to 0.75 lagging – A supplementary charge of 1.5% of the bill for that month for each 0.01 part below 0.85 and up to 0.75 lagging Power Factor will be added to the bill for that month. Below 0.75 lagging – In addition to the charge payable under the subparagraph above, a supplementary charge of 3% of the bill for that month for each 0.01 part below 0.75 lagging Power Factor will be added to the bill for that month. Maximum Demand is the “billing demand” measured in kW, i.e. the maximum demand registered during the month, 75% of the maximum demand registered during the preceding 11 months, or the contract demand—whichever is higher (contract demand being equal to the estimated maximum demand at the meter point at the time of connection). The maximum applied demand for customers who are eligible for the Industrial 1 (I1) or Commercial 1 (C1) tariff class is set at a limit of 1.5MVA. For any applied load above 1.5MVA, the customer shall be classified under the demand tariff class C2/C3 or I2/I3 with demand metering. 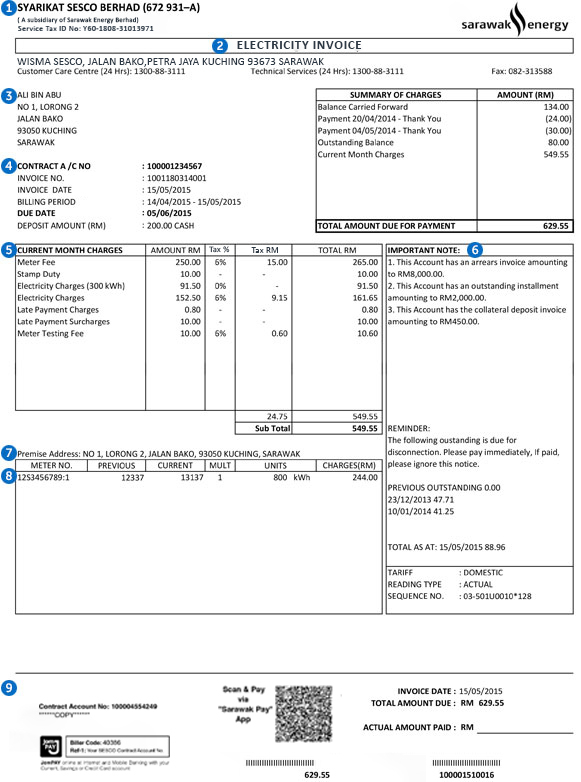 Account details: Contract account number, tax invoice number, tax invoice date, billing period, payment due date and collateral deposit amount.